As a whistling tune seeps into what seems to pay homage to Oldboy’s corridor scene, with relentless bloodshed and ragged gasps, the opening sequence comes on too strong before viewers can get their bearings. The first 10 minutes of the film are shot in first-person point-of-view, which enables viewers to stay engaged and to be active participants rather than passive sponges. Sook-hee (played by Kim Ok-bin) regains consciousness in what looks like a psychiatric ward. She storms out of it and wanders in a maze of passages whose doors introduce a different level of reality. Level-headed, Intelligence agency chief Kwon (Kim Seo-hyung) draws, then has Sook-hee sit with a sonogram and encourages her to be a sleeper agent for a decade, in exchange for freedom and a better life, with her child. Sook-hee’s backstory of having witnessed, as a child, the brutal killing of her father, of extracting her own revenge and of having been brought up to become a killing machine by Joong-sang (Shin ha-kyun), is told in the course of the film, which moves nimbly, dizzyingly, forward and backward in time. A salient scene, where Sook-hee’s pupils dilate as her sniper rifle locks on her target, Joong-sang whom she’s believed to be dead, renders viewers perplexed. The masterful utilization of a hand-held camera and the beating of the kkwaenggwari (a small flat gong) thundering through the frame set an upbeat tone for the elaborate action scenes, and dynamic tension is cranked up as the camera closely tracks moving bodily parts and speeding vehicles. The thrilling momentum seldom lets up except for the saccharine interlude between Sook-hee and Hyun-soo (Sung Joon). 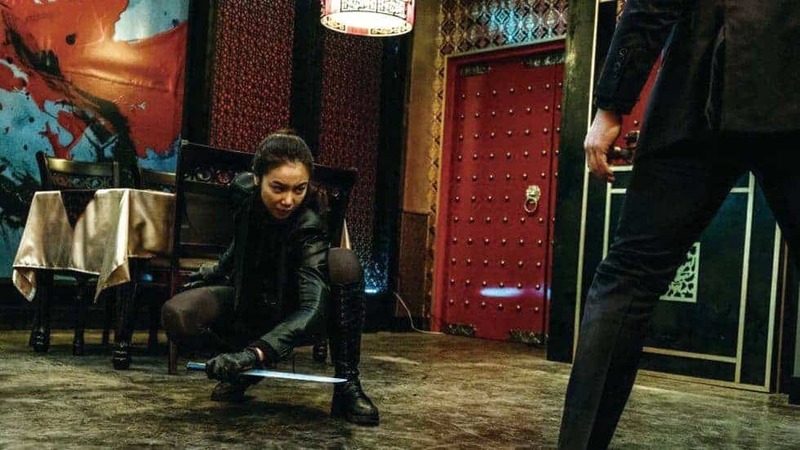 Deftly wielding weapons and leaning out of a running bus, Kim Ok-bin delivers probably her most unforgiving and visually remarkable action performance. Meanwhile, Shin ha-kyun performs a true feat, pulling off the imperturbable, diabolical character. Director Jung Byung-gil, pushing his filming techniques to new heights with his cobalt blue and turquoise-hued, lustrous imagery and his succinct, yet comprehensive storytelling, proves to be a force to be reckoned with.